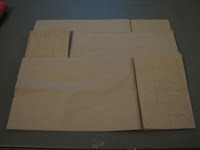 I have had several requests for instructions on how to make my paper bag album, so I made a quick tutorial to show you the basics. 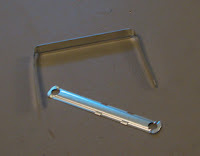 1 2-prong binding clip (front and back pieces)...I got a bunch of these from my local Staples store. 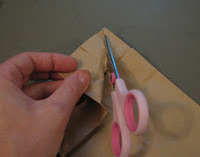 Then you will cut along the fold that goes from inside of where you just cut to the outside corner shown here (be sure to cut back to both corners). You should be able to completely open up the flap. 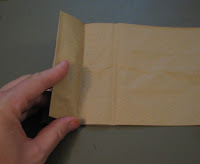 Second, we need to arrange the paper bags so that the bottoms of the bags (flaps in) are facing you and alternate them so that the first bag down has the bottom (or flap) to the right, the second, the bottom (or flap) is to the left, and the third bag has the bottom (or flap) to the right. 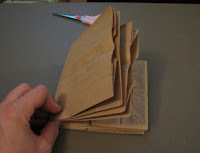 Fold all three bags together and make a good crease. 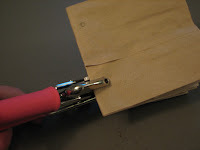 You then take the 2-prong binding clip and using only the bottom piece (the one with the holes on each end), center it at the edge of the folded side of the paper bags and mark the holes with a pen or pencil. You then take your Crop-A-Dile (or other good, heavy-duty punch) and punch holes through all three paper bags at the marks you just made. 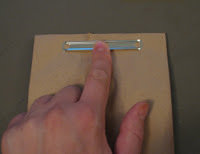 With the two prongs on the binding clip, insert them through the holes in the album. Secure them on the other side with the rest of the binding clip. 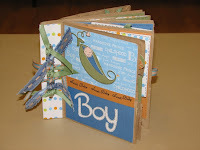 You now have a blank paper bag album that you can decorate and embellish any way you would like. Here are a couple of albums that I have made using this technique and links with examples of how they can be decorated. 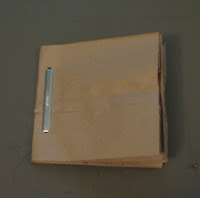 The sizes of paper/cardstock that I use for the pull out pages and to secure to the book itself are 4 inches by 5 inches. The size that I put on the flaps are 3 inches by 5 inches. I also use a stronger adhesive to secure the paper/cardstock to the paper bag album than what I normally use on my layouts. Thanks for sharing your tutorial. I'm going to try one when I get our 4th of July pictures printed. 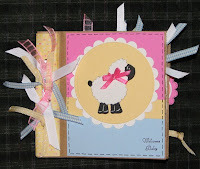 Thanks for the tutorial.I love paper bag albums,but haven't made one yet.Maybe I'll get motivated now. Great job on the tutorial! I love the looks of that boy album, too! 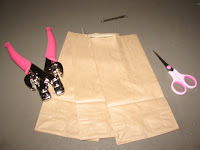 Oh, I have wanted to make one of these; when the time is right, I will be back to follow your instructions! I love your albums! So glad I came across this tutorial!! I love your baby girl and baby boy albums!! I am now a follower because I love your blog! !